Installing SanFoot is Simple - Jacaranda, Inc.
SanFoot’s many distinctive features have made it the choice of some of the world’s most elite establishments, including performing arts centers, universities, public spaces and healthcare facilities. Architects and designers find Jacaranda, Inc., products to be versatile, simple, beautiful and cost-effective alternatives to conventional wood panels. The application process is designed to be fast and simple so that you always get the beautiful results you want. The veneer can be installed much like vinyl wall covering; you can even use the same tools. We ship it to you ready to apply with your choice of finishes and backings. Its five-ply construction ensures maximum flexibility, and it can be applied easily to contoured areas such as curved walls or columns. Unlike other veneers, it can even be applied directly to 90-degree corners without damaging the wood or interrupting the pattern. 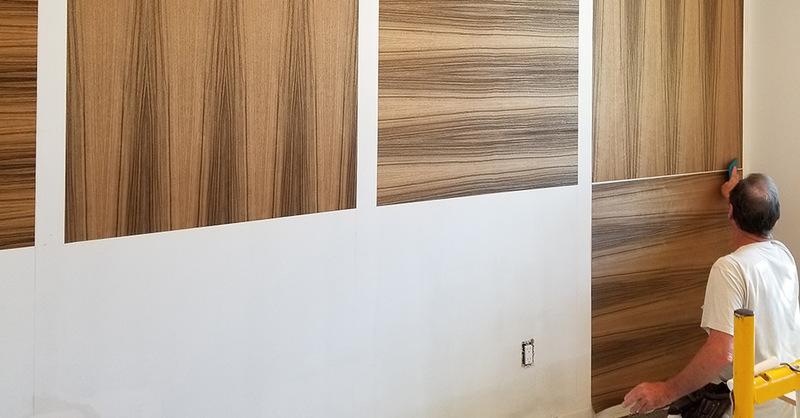 Every wood veneer sheet we supply is book matched taking the guesswork out of installation and making it easy to create the final look you want. Color, grain and detail can vary slightly from flitch to flitch, so we mark the reverse side of each sheet with a sequence and flitch number. You can use these numbers to install the sheets in the correct order and to create the desired patterns. Slip match and recons can be stack matched while book matched veneers can be end matched. We recommend using specific primers and adhesives based on the installation surfaces and conditions to achieve the best results. The results will be eye-catching and attractive. When you install wood veneer by Jacaranda, Inc., there is no need to add any finishing or final coating because every sheet of our natural veneer comes pre-finished. The two coats of clear urethane standard satin sheen offers added protection and heightens the wood’s natural beauty. The finish can be increased to a 30-percent semi-gloss sheen, which is ideal for higher-traffic areas. A 70-percent high gloss is also available to create a visually stunning effect, perfect for a mirrored statement piece or a high-impact area that needs a strong, durable coat. SanFoot natural wood veneer wallcovering is flexible, durable, class A fire-rated and architectural grade AA quality. Available in more than 100 different species, including rare and exotic recons, for your walls, ceilings, millwork and more, you can customize our veneers with your choice of stain, dye, cuts and finishes for a look that complements other features of your property. We work with you to ensure your complete satisfaction, and if we don’t have what you want, we will work to provide you with a solution. Regardless whether you choose something we have or we create something just for you, you can be confident that it will be easy to apply and beautiful to use. At Jacaranda, Inc., we work closely with property owners, builders, architects and designers to create and install wood veneer that will add value and beauty to buildings. Check out our website today to learn more or to explore our extensive selection of products.